Hey there! I hope the new year is going great for all of you so far. I know mine has been jam packed with to-dos. We are officially moving next week and we still have so much to do! I wanted to start the new year off right with a fresh slate aka A New Handbag. I don’t know about you, but my handbag starts feeling like a million pounds whenever I’m on the go a lot. Throughout the holiday season I noticed how everything always felt crammed in there. It was a daily struggle to find my keys or get a tissue quickly when I needed it. I started browsing online for a new bag, but then I started looking at the prices and thinking about all my upcoming bills and I just couldn’t do it. I have written about how my capsule wardrobe has changed how I think and shop, but the desire to go out and buy something when I’m unhappy hasn’t quite gone away. I’m working on it. 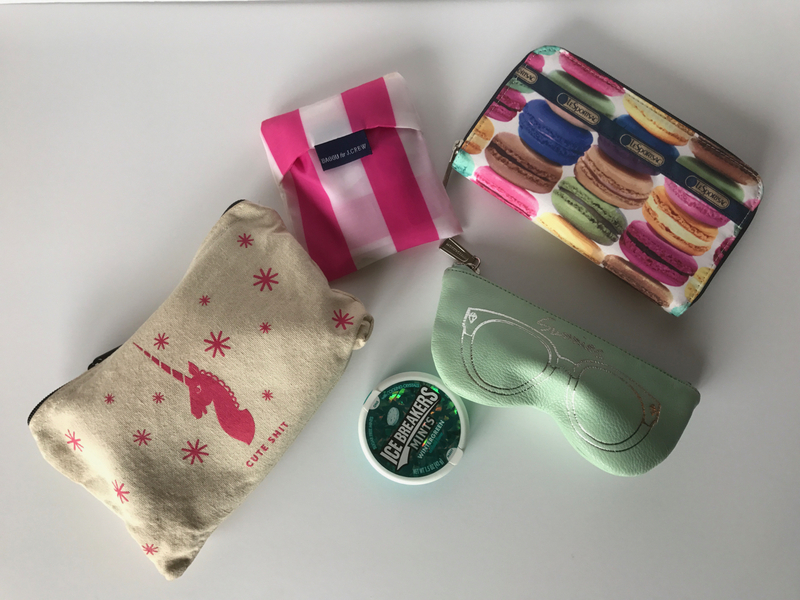 I want to be more intentional about how I spend my money, so I thought that instead of immediately going out and buying something new, I’d evaluate if there is a way to pack my purse so everything fits better. I also want to implement what I learned from Marie Kondo’s books, because I’ve had a lot of success with keeping my house tidier last year. Maybe it’s not my purse that is too small, maybe I just have too much stuff. Right now I’m using my Lesportsac Hobo, which is a pretty standard medium sized bag—smaller than most of my leather handbags, but bigger than many of my purses/clutches for a night out. I’ve had this one for several years, and it’s still in excellent shape. It’s black patent leather with little gold hearts, which for me goes with everything. I actually love the patent leather in the rainy winter! I would recommend this style of bag because it has great interior and exterior pockets. I currently keep my reusable shopping bag and mints in one exterior pocket, and my keys and random papers in the other. I keep my phone and headset in the interior pocket. In the main compartment I have three items—my wallet, sunglass case, and makeup bag. When empty, my bag is nearly weightless but it still maintains its shape. All styles of bags have their pluses and negatives, so it’s key to understand the design features of flaws of your own. 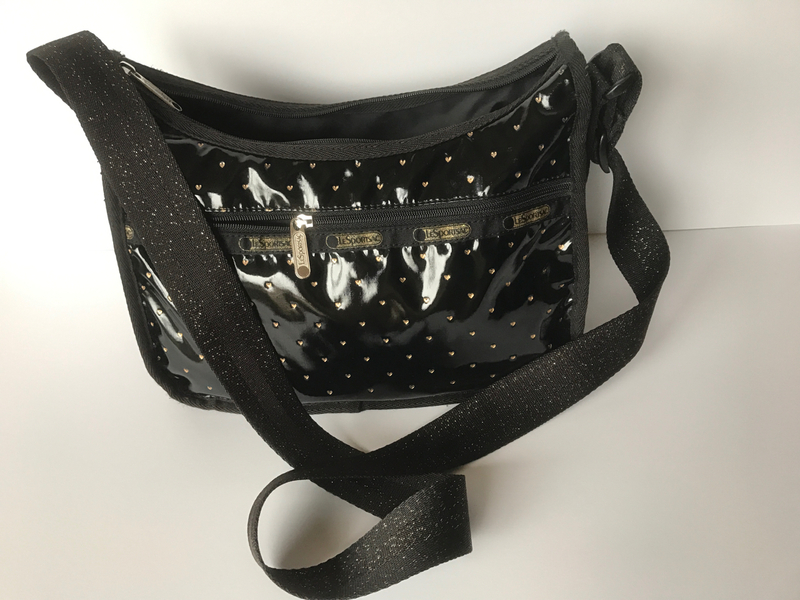 If you’re using a highly structured and heavy leather purse, it’s not going to be great for bulky items like water bottles that take up a lot of room and are added weight. If you’re using a shapeless and lightweight bag, you might feel like it’s a bottomless abyss. Look at your bag and just be honest with yourself—are you carrying the right kind of bag for your lifestyle? Theoretically, my bag should be big enough to carry all my essentials, but the problem seems to be that I carry way more than just the essentials in my makeup bag and wallet. I also let my bag accumulate way more than I want or need to carry. Marie Kondo advises that purses should be emptied out daily and then repacked each morning, but I confess I can’t or won’t commit to that. I am always in a hurry, and the last thing I want to do is pack my bag each morning. But I do think it’s critical to empty out your purse periodically. Clean out those random papers, wrappers, and receipts. Empty out the crumbs, and wipe down the interior if needed. I don’t usually have food in my purse, but having a toddler means there are crumbs literally everywhere now despite my best efforts. Sometimes I don’t want to lug a diaper bag so I’ll toss a snacks and water in my bag and that can be a bit disastrous. I am more meticulous with designer leather purses and almost never carry food or water in them. You can extend the life of a handbag by containing any potential messes. Invest in a good makeup bag or pencil pouch, and use a plastic or other waterproof bags for any food you want to carry. You see here how my makeup bag has started to house my collection of lip products, cold remedies, creams, and other odds and ends? I don’t recommend this, as it’s inevitable that my tampons go flying when I can’t find something during that time of the month. (I am trying to be better about taking out feminine hygiene products when I don’t need them.) To streamline my handbag, I decided to limit my lip products to TWO, and I’m going to try and be better about only carrying cold meds and my inhaler when I need them instead of all the time. Think of how to curate a handbag with just what you need on most days instead of packing everything plus the kitchen sink. The goal is to feel organized and decrease the load you’re carrying if your bag feels too heavy. 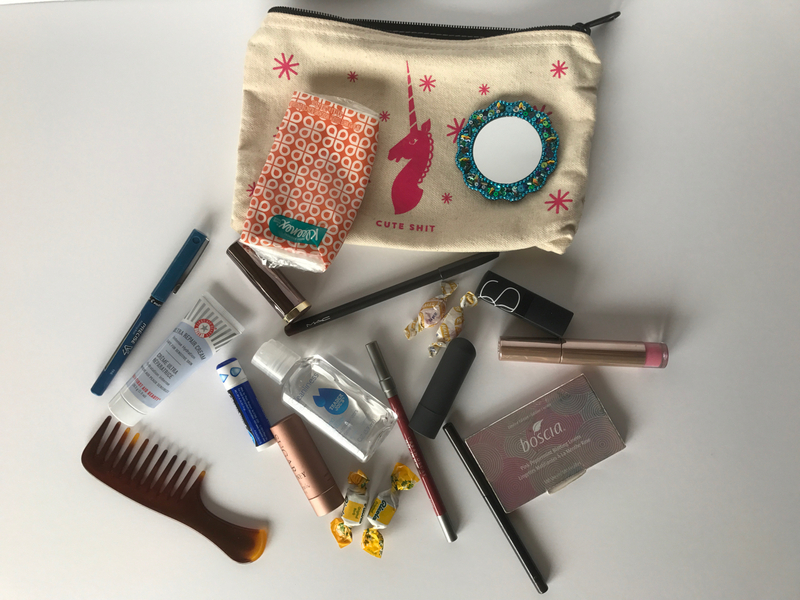 After you’ve cleaned out your purse and perhaps downsized your stuff, try wearing your bag for a day and see how it feels. Does it feel lighter? When you’re out and about, do you feel like you can easily access your stuff or does your bag still feel too snug for its contents? Determine if the shape, size, and style really work for you before buying anything else. If you’ve committed to a new year of buying less or you’re trying to start a capsule wardrobe, now isn’t the time to be acquiring more. When you see your handbag, do you feel joy? Even if you don’t like Marie Kondo’s methods, can’t we at least agree that handbags should make us feel happy when we see them. It’s been about a week since I started my experiment, and I think I’m going to hold on to my handbag. For the most part, I’m really happy with my bag. I do think my wallet is a bit bulky and it’s more than half empty, so I’ll be switching to a much smaller one I already own. I’m also debating if I really need to carry my reusable shopping bag and mints everywhere. Small tweaks to what I’m carrying really seems to be helping. (Also, remembering to unload papers and random crap more frequently!) I love the idea of making what I already have and love work better for me. Honestly, you can have the feel of a new handbag for free, but don’t forget that we all reserve the right to change our minds and change our purses! Such great advice, as always! I will be interested to hear if, after going through this deliberation, it becomes sort of self-maintaining. As much as I enjoy a lot of Kondo’s method, the daily emptying of the purse thing is not something that would be sustainable for me, but if you find there’s sort of a rhythm to your modified method (say, crumbs start re-amassing around the month mark or something), it’d be cool to have your recommendation there as well! Thanks! I kind of fit in writing in between all the chaos. I do think we each have to find a good rhythm to clearing out the clutter in any space we inhabit. It’s easy to overlook the handbag and just size up so you can keep it really stuffed. I have done really well keeping my lip products to a minimum and taking stuff out a couple of times a week. Ultimately though, I will admit, I went back to another Lesportsac that I have that is just a hair bigger. While I was packing and moving I felt like I was living out of my purse, and I really needed just a bit more room. I’ll probably go back to my patent leather one though soon because I love do prefer traveling light day to day if I can.